The castle you see today is the result of over 900 years of alterations and changes. It has Norman foundations; a mediaeval gatehouse; the Gloriette, built by Edward I and updated in Henry VIII’s times; a Tudor tower; and a 19th century country house – all of which were substantially refurbished in the 20th century. The last private owner of the castle, Olive, Lady Baillie, left an indelible mark on the place. The heiress to an American fortune from her mother’s family and the daughter of an English Lord, she married three times. It was with her second husband, Arthur Wilson Filmer that she bought the castle in 1926, and embarked on a complete refurbishment, using the finest French architects and designers to create an elegant country residence. She filled the castle with art and antiques, collected on her frequent buying trips around Europe, and with glamorous house parties at which she entertained princes, film stars and politicians. Her guests enjoyed the use of the castle’s cinema, swimming pool, squash and tennis courts, and marveled at the extraordinary creatures in the grounds; Lady Baillie’s fascinating collection of birds and waterfowl, zebras and llamas as well as the more usual horses and dogs. As Rochester blocked the Watling Street, at the crossing of the Dledwvay, A between Dover, or rather Canterbury, and London, so the central fortress of Leeds lay close to the second Roman road, starting from the Lemanis Portus at West Hythe, and passing by Charing and Maidstone, either to Rochester, or to a junction with the Watling Street east of Dartford. The first notice found of the place is towards the end of the ninth century, when it was built, as is believed, during the reign of Ethelbert, King of Kent. Some stronghold existed there at thy Conquest, which, with the lands, was given to Bishop Odo, after whose fall in 1088 the Crown resumed possession and granted Ledes to a member of the Norman Crevecoeur family. Hugh Crevecoeur was one of the eight knights appointed under their tenures to guard Dover Castle ; they were (1) William d’Albrincis; (2) Fulberl de Dover; (3) William d’Arsic; (4) Geoffrey Peverell ; (5) William Maminot ; (6) Robert du Port ; (7) Hugh Crevecoeur ; (8) Adam Fitzwilliam. Ledes was one of the manors thus held. Vaillans homs sans mes et sans si. Leeds belonged to the Crown, in chief, from Edward I. till the reign of Edward VI., a period of near 300 years. The first Edward and his Queen were here several times between 1279 and 1290, at which latter period the swimming-bath and its tower were planned and built, the many alterations and additions then in progress taking several years to carry out. At this time the castle was used frequently for the entertainment of distinguished foreigners on their way to and from the Continent. Edward II., on the death of the Queen Dowager Margaret in 1314, gave the reversion of Leeds to his faithless Queen, Isabella, but a noble of great importance, Bartholomew, Lord Badlesmere, was appointed constable, an office which meant possession, in some cases, from father to son. In his time occurred one of the most memorable events in the history of the fortress. Badlesmere had taken part with the associated barons in 1321 against the King’s favourites, the Despencers, and was away in the north, leaving his wife and children at Leeds, when one evening Queen Isabella, returning from Canterbury, appeared with a considerable attendant force before the gates demanding admittance. She had formed this plan of recovering possession of the castle, which it is quite unlikely had been exchanged with Badlesmere, as was pretended, for Aldrithleye, in Shropshire, without any notification to the Queen, especially as the absent owner afterwards wrote a letter, approving of his wife’s refusal of what really amounted to delivery. At all events, the castellan, Sir Thomas Colepeper, refused to open the gates without orders from his lord, and on the party of the Queen trying to force an entrance, they were received with a volley of arrows, which slew six of them (In 1822, in opening the ground near the principal entrance to the castle, the remains of these men were dug up, just 500 years afterwards.). Isabella had to find a lodging in the vicinity, and then, repairing to the King at the Tower of London, complained formally of the indignity offered to her ; whereon the King, who had probably concocted the whole scheme for getting possession of Leeds, ordered a levy of all men in the four neighbouring counties between the ages of sixteen and sixty, together with the posse comitatus of Kent, to assemble before Leeds Castle in six days, under the command of Aymer de Valence, to punish his wife’s contemptuous treatment, whilst he himself, with his two brothers and a number of nobles, pressed the siege. Meantime, Lord Badlesmere, warned of what was taking place, attempted, with his friends, to relieve the fortress, but they were beaten off, and forced to retire to Kingston. The besieged then surrendered (November 1), and, according to Holinshed, thirteen of them were executed at once, Colepeper, the castellan, being dragged out at the tail of a horse, and hung on the drawbridge with eleven others, while Lady Badlesmere and her children were sent to the Tower. (See also, CASTLE COMBE, Wilts.) The next spring Lord Badlesmere was captured, with Thomas, Earl of Lancaster, at the battle at Boroughbridge, and, being brought to Canterbury, was there executed, and his head fixed over the Borough gate. 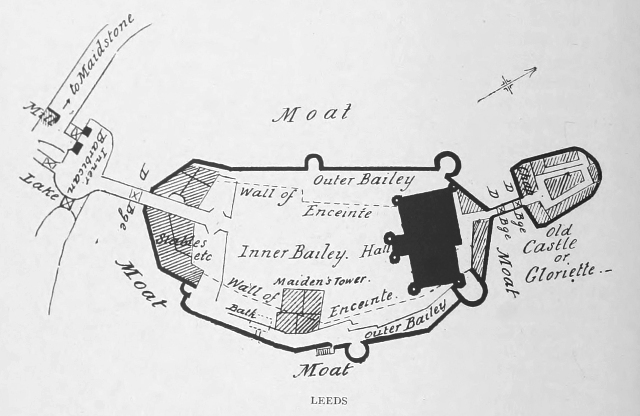 Leeds was then retained by the Crown, and eventually the lady and her family were allowed to possess Aldrithleye, but after the death of the rich Lord of Leeds, that fortress fell into ruinous disrepair, and though in 1359 William of Wykeham was appointed chief warder and surveyor, he was then young, and no work of his can be identified. Edward II. came there twice in 1325-26, after his wife had deserted him. Edward III. settled Leeds on his queen, and it formed a part of the settlement of Anne of Bohemia, the first queen of Richard II., who often resorted here, and who was brought to Leeds on his deposition. Henry IV. was here in 1401, and granted this castle for his lifetime to Archbishop Arundel, who from here fulminated against the Lollards, and summoned Lord Cobham (Sir John Oldcastle) to attend his trial before him for heresy, “in the greater chapel of Ledes Castle.” Cobham failing to appear, sentence was passed on him by Arundel for contumacy, which led to the subsequent martyrdom of that great man under Henry V., who refused to save his old companion-in-arms. (See COOLING, KENT.) At Leeds Henry V. received the Emperor Sigismund, and he made this place in 1419 the prison of his stepmother Joan, who, being tried for practising witchcraft, was kept prisoner here before her long solitary confinement at Pevensey, until she was restored and her innocence acknowledged by Henry V. on his death-bed. Henry VI. was here in 1436 and 1438, and in 1431 the trial of Eleanor, Duchess of Gloucester, the wife of Henry’s uncle Humphrey, was held in the castle chapel by Archbishop Henry Chichele for sorcery. She confessed to a part of the charge, and after three days of penance in London, was imprisoned for life. Then the Court party laid hands on her husband, “the good duke,” who, being arrested for treason and thrown into prison by the Parliament assembled at Bury St. Edmunds, was found strangled in bed soon after, never having been brought to trial. There can be no doubt of the interest of Henry VIII. in this castle : many of the renewals and additions were made in his reign, and it is said that the Maidens’ Tower was so called from its appropriation at that date to the maids of honour. Mr. Wykeham Martin, in his admirable memorial of this, his family’s ancestral seat, gives a drawing of a small casket of green velvet bound .with golden bands, containing the Book of Collects, which Queen Anne Boleyn left behind here. Finally the castle .was alienated from the Crown by Edward VI. in favour of Sir Anthony St. Leger, about 1550, and his descendants after 1618 sold it to Sir Richard Smith, of the Strangford family, at which time an Elizabethan mansion was built on the middle island. The heirs, his daughters, after 1631, sold it again to Thomas Colepeper, of Hollingbourne, of a family once numerous and powerful in Kent, to which belonged the brave and ill-fated castellan who offended the “She-Wolf of France.” These owners, who were raised to the peerage in 1644, leased the castle to the Government in 1655, for the safe keeping of 500 prisoners taken in Cromwell’s victory over the Dutch. They were placed under the care of John Evelyn, who, in his diary on October 17 of that year, says he hired the place of Lord Culpeper for this purpose, and in November 1666, he had 600 Dutch and French sailors there, who were detained till the Peace of Breda in 1667. Under date May 8, 1666, he writes : “To Leeds Castle, once a famous hold, now hired by me of my Lord Culpeper for a prison. Here I flowed [flooded] the drie moat, made a new drawbridge, brought spring water into the court of ye castle to an old fountaine, and took orders for ye repaires.” A daughter and heiress of Thomas, second Lord Colepeper, married Thomas, fifth Lord Fairfax, and brought him Leeds Castle. Robert, seventh Lord Fairfax put the buildings in repair, and entertained here, in 1778, King George III. and his Queen. He left Leeds to his sister’s third son, the Rev. D. Martin, of Loose, who, dying in 1800, was succeeded in the property by his brother, General Philip Martin, from whom it descended in 1821 to Fiennes Wykeham, of the Swalcliff family, who adopted the name of Martin, and in whose family the old pile remains and is carefully preserved, the present owner being bar. Cornwallis P. Wykeham-Martin. 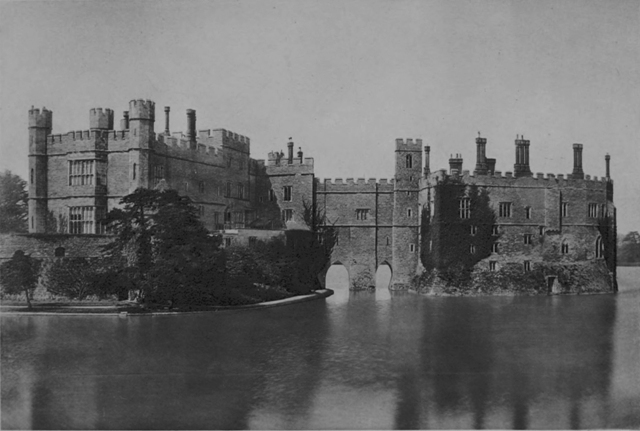 The Leeds Castle which Horace Walpole visited in 1752 is not altogether the place we see now, with its towers and walls rising so splendidly from the lake, which water Walpole, in his misleading way, calls “the only handsom object;” for in 1822, in place of the sixteenth century mansion erected on the central island by Sir Richard Smith, the existing buildings were constructed in the Tudor style, a great part of the inner bailey and of the keep hawing been the work of Henry VIII. The Len stream flowing.through the property afforded the one great element of defence on which our ancestors chiefly relied; here some twenty acres surrounding the castle might by means of sluices be turned into a lake if occasion required. Anyway, thank you for what you have already posted. Looking forward to what else you can point me too. For the most part the information is from Castles Of England, Sir James D. Mackenzie, 1896 as stated above. His book is very good, and generally well researched, but in some cases more recent research differs from what he says. On the other hand, in many cases there are many things he records which have been destroyed in the intervening century.